A 26-year-old man who has never passed his driving test has been jailed for 18 months after he admitted driving a BMW dangerously after trying to escape from police in Northampton. 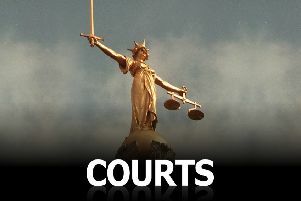 Colin Simpson, of Finedon Road, Burton Latimer, was seen driving too fast on a roundabout near Weston Favell Police Station on May 29 at 6.25pm. A police officer in a marked car began following Simpson’s silver BMW along the A43 and indicated for him to pull over. However, Simpson failed to stop and then accelerated on to the A45 and travelled at a speed above 100mph. The court heard that Simpson’s car then left the A45 at Earls Barton and he then continued at speeds of up to 70mph on the single carriageway road. He also overtook cars on blind bends and crossed solid white lines. Due to the dangerousness of the driving, the police officer made the decision to stop pursuing the car. However, the police helicopter tracked the BMW and an off-duty officer started following the vehicle on the A45 near Raunds. The off-duty officer witnessed the BMW travelling at speeds above 90mph and carrying out overtaking manoeuvres that caused other car to swerve out of the way. The police officer made the decision to stop the vehicle by cutting across the front of it. In total the pursuit of the BMW last almost an hour. The court heard that Simpson, who has a previous conviction for dangerous driving, has never passed a driving test. Paul Orton, mitigating, said his client had “panicked” and knew he should not have tried to get away from the police cars. Judge Lynn Tayton sentenced Simpson to 14 months in prison for dangerous driving and four months, to be served consecutively for driving without a licence. Simpson was disqualified from driving for three years. He must also pay court costs of £180. He is likely to serve half his prison sentence before being released on licence.